LAX Firing Range is a local to Long Beach shooting range with fully-automatic, indoor lanes. These indoor lanes allow customers to practice their shooting all year long, without having to worry about rain, heat and cool temperatures. This Long Beach shooting range just recently announced their 2017 Gun Show schedule. They travel across California and even into Utah with their parent company who manufactures and sells reloaded and factory-new ammunition. In January, the Long Beach shooting range will be traveling to Daly City, Ca, Bakersfield, Ca, Costa Mesa, Ca and Lancaster, Ca. 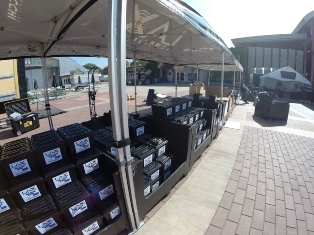 Gun show attendees will have the opportunity to shop for discounted ammunition that will last them the entire year and beyond. In February, they are headed to the following California cities: Fresno, Victorville, and Ventura. They will also be at the popular Sandy, Utah gun show on February 4th and 5th from 9:00am to 4:30pm. In addition to their frequent gun show appearances, LAX Firing Range hosts quarterly parking lot sales at the range. These parking lot sales are where Long Beach shooting range customers can expect to find the best deals on all things ammunition. The range wants every individual to invest in their safety, which is why they offer a variety of firearms courses throughout the year. Whether you’re a beginner or an expert shooter, the Long Beach shooting range will have a course for you. LAX Firing Range is a trusted, local to Long Beach shooting range. They have proudly been offering their products and services to customers for over 22 years. Their sister company manufacturers ammunition which is sold right in the range for range customers to use for target practice. To learn more about LAX Firing Range, visit their website: http://www.laxrange.com/ or call 310) 568-1515. They are centrally located at 927 W. Manchester Blvd., Inglewood CA, 90301, right of the 405 freeway.